1. Ok so first up is ALL my mermaid pieces from Black Milk. I have leggings, catsuits, bodysuits, dresses, skirts…you name it, I probably have at least 1 piece in each style. Some pieces are still for sale on the BM site, however some are museum pieces now. They are completely lovable, comfy and stylish – perfect for any mermaid out there! My most worn pieces are my leggings and catsuits, paired with a baggy black top – Perfect for a day chilling out with the land dwellers! 2. Next up is mermaid locks! It doesn’t matter the length, but the condition and colour of course makes a huge impact! You want a bit of volume, a few waves or curls and a striking colour! I’m currently rocking Directions – Cerise by La Riche. I’ve found out of all the different semi-permanent, bright dyes, Directions is the best for my hair. Its made with vegetable extracts and really nourishes my hair. It advises leaving on for 20-30mins but I go for an hour and it gives me an extra vibrant colour! I also mix up my shampoos and conditioners, but currently I’m working with Tresemme. 3. Your mermaid accessories! I found these gorgeous glasses from Jeepers Peepers on ASOS. I love how beautifully colourful they are, they really make me feel like I’m part of the sea! They’re also fairly striking as the shape is a slight cats eye combined with a rounded lens- fairly unusual if I do say so myself! The Holographic purse is from Topshop, although it was from last year. Not to fear, sparkly stuff is still around in all sorts of places i.e Skinny Dip where the above bag is from. I’m lusting after this bag so badly – it really is on my wishlist! Its more than beautiful, it is divine! If a shell shape isn’t for you, they have plenty of other styles for you to chose from. 4. How can we forget, the mermaid blanket! A new thing in my life, it truly is making me feel more and more like a mermaid every day! A great gift for my birthday from my gorgeous friends, It is more like a sleeping bag than a blanket, that you fit your feet into and chill out in. As you can see, the pure joy on my face when I first unwrapped it (picture on the right) says it all! Its seriously cosy and I could snuggle up in it all day! That’s just a few of my mermaid staples, there’ll be plenty more along the way I promise! But for now, discover what makes you feel magical and roll with it! 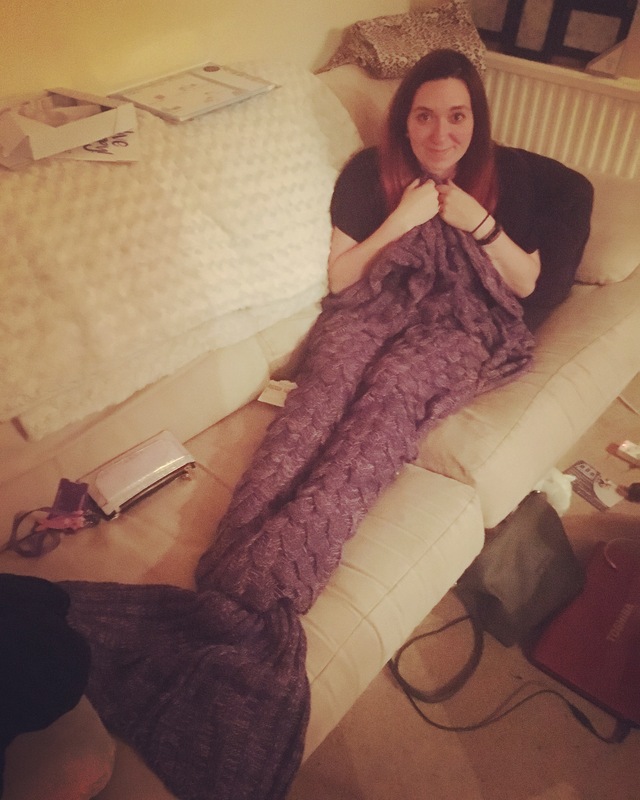 I’ve been toying with the idea of investing in a mermaid blanket for ages now, as I’m perpetually chilly from the end of September until about June, but I just KNOW I’d forget I was wearing it and end up smashing all my teeth on our hearth!! omg, your blog is adorable! ALSO, I have to say how much I love the Platform 9 3/4 pic, in particular. I photobombed the place when I was in King’s Cross just because the line was so long, buuut it would’ve been so fun to get that shot! Anyway, HI and happy Thursday!! Love these! Such a cute post.. I so need a mermaid tail blanket! Love this post, it’s super cute! Loving the mermaid tail! !